Based on real-world events, The Perfect Storm will have you on the edge of your seat in this engaging drama thriller. Starring George Clooney and Mark Wahlberg as fisherman aboard the six member crew of the Andrea Gail, they are about to embark on the last trip of the season. On the eve of Halloween, the Andrea Gail sets sail across the rough seas near Gloucester Massachusetts in a hope to bring back the catch of the season. Unbeknownst to crew of the Andrea Gail, a deadly storm is heading their way and through their heroism and thirst for life, they attempt to fight the inevitable. What sets this movie apart from other similar films about natural disasters is the realistic human spirit and brotherhood amongst the fishing vessel that has made them a family. With gigantic waves and almost blinding rain, The Perfect Storm features some outstanding special effects that may be a little dated at times, still stands up quite well, however the true stars of the movie are Clooney and Wahlberg plus Diane Lane as the woman who fears the worst for her "children". The movie is quite emotional at times and be warned for those who have not seen this movie, it does have a few unexpected twists and tears. 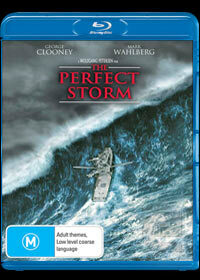 Although the Perfect Storm has been out for a few years now on DVD, the Blu-Ray version features 1080p HD Widescreen which boasts vibrant colours and exceptional picture quality that is matched perfectly with the sound quality of this disc. In conclusion, The Perfect Storm is one of director Wolfgang Petersen's best movies who has managed to capture the true spirit of these fishing vessels. A first class experience from start to finish!